San Luis Galveston Island Texas Photos and Pictures. 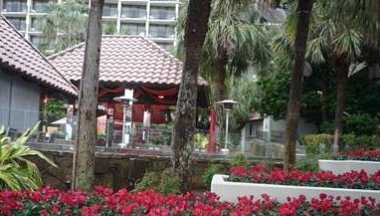 During our time in San Luis Galveston, we took some photos of the hotel and its surroundings that we like to share with vacationers and tourists who might want to visit Galveston. 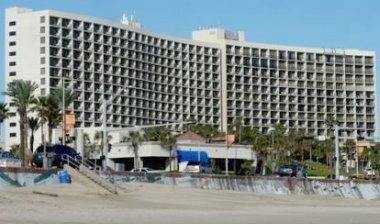 This is the front side of the hotel, showing the Galveston seawall and the Seawall beach. Vacation traffic is very heavy around here especially in Spring and Summer. This is another view of the swimming pool from the hotel. It sits right on top of the hill. 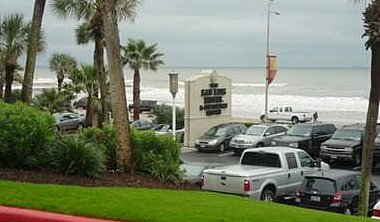 This is the sea view from the front entrance to the Galveston Hotel. It was rainy and windy on this day. The sea was quite rough but this didn't deter joggers and strollers along the seawall. This is San Luis scenery on the outside of the hotel. A very tropical surrounding. 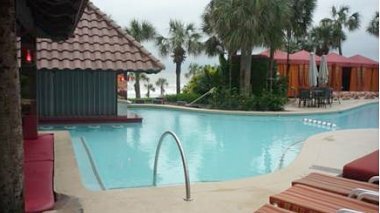 Experience the Caribbean setting in Galveston Texas. 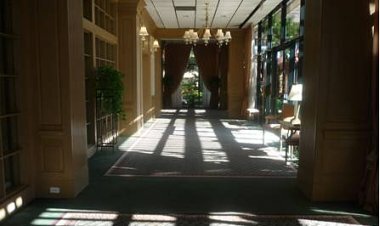 This is the main San Luis walkway into the hotel. 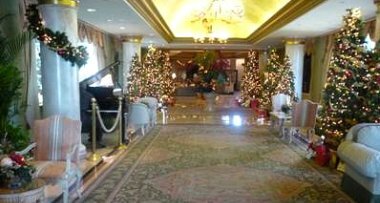 It was beautifully decorated around Christmas time. The weather is not too cold here. It was about 45 degrees Fahrenheit on this day but the hotel was full. A San Luis floor close to the restaurant and the swimming pool. 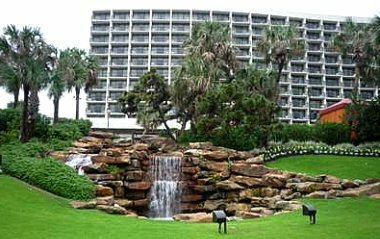 The waterfall at San Luis resort Galveston is illuminated at night with some light connections. The swimming pool sits on top of the waterfall.